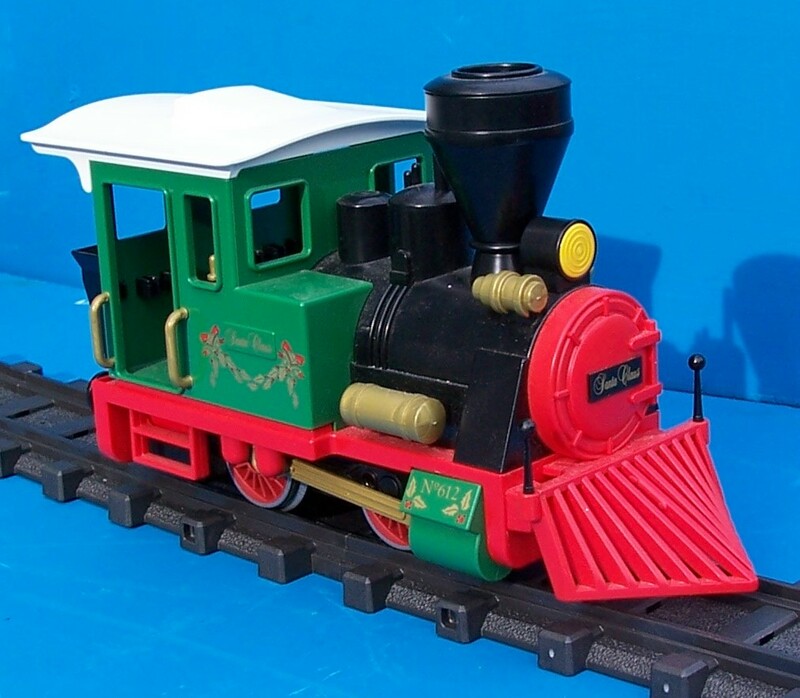 The original track powered trains were supplied with LGB track with a gauge of 45mm. 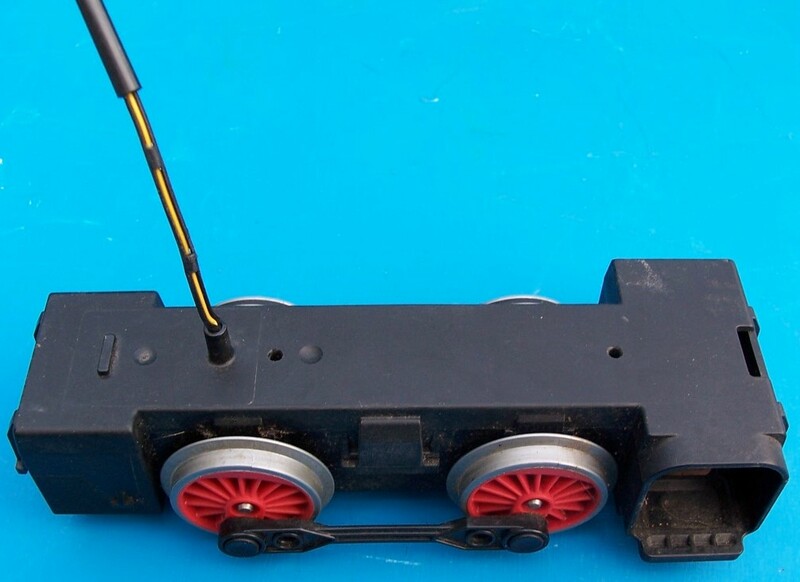 The battery powered trains are supplied with plastic track with a gauge of 45mm. These trains will run on the LGB track. To make sure there is a good power pick up for the locomotive the track must be clean. The pick up shoes should be clean and free to move up and down so that they keep in contact with the track at all times. 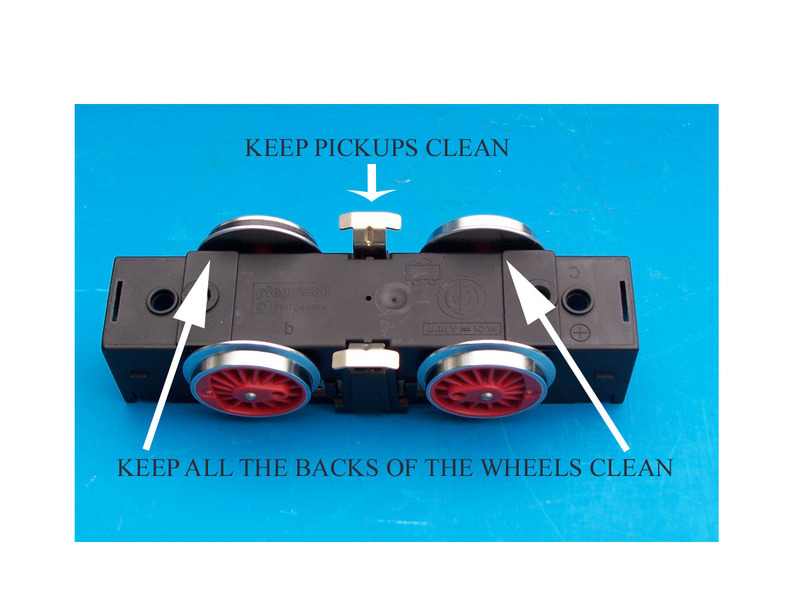 Keep the wheel flanges, rim and backs clean and free from dirt, oil, and grease. If it is needed to oil the axels just put a small drop of oil where the axel goes into the motor block. Do not use the locomotives on carpets as they will pick up hairs from the carpets on to the axels and wheels. Do not overload the locomotives by trying to pull a lot of coaches and wagons. 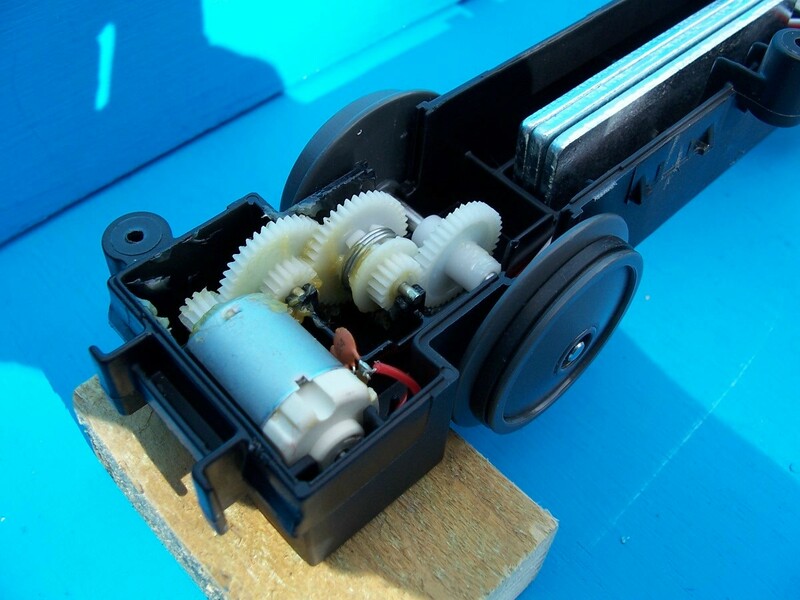 This may cause the plastic gear wheel in the motor block to strip. The motor block and spare parts are not now available from Playmobil. 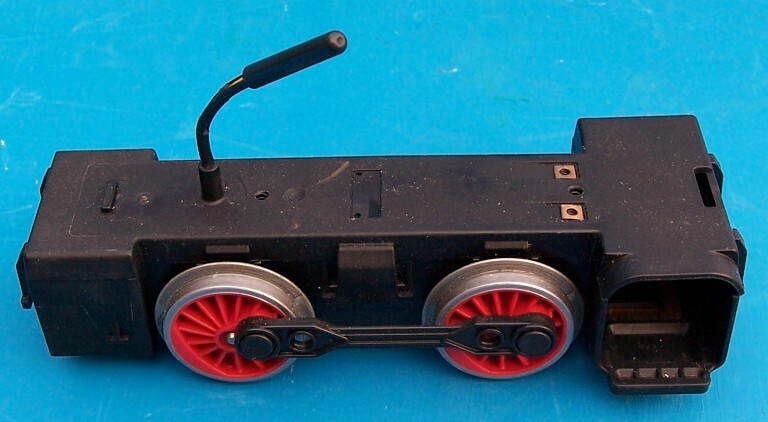 The original track supplied in the Playmobil sets that picked up from the track was made by LGB. 16 volts, so the lamps lasted a long time. 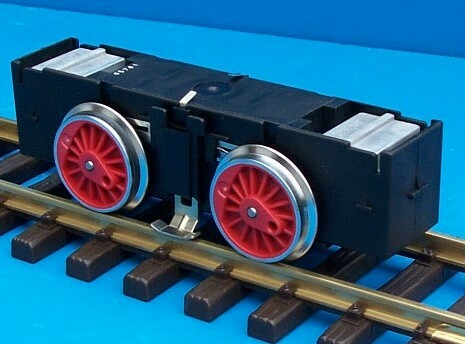 Should these locos be operated on different controllers such as LGB, Gaugemaster and other manufactures, the output on these controllers can be between 18 volts and 24 volts. So if you have a driver who likes to see the locos run flat out you will soon see your lamp go out. The lamps are not now available from Playmobil so to keep your lights on drive the loco at a slower speed. The first R.C. 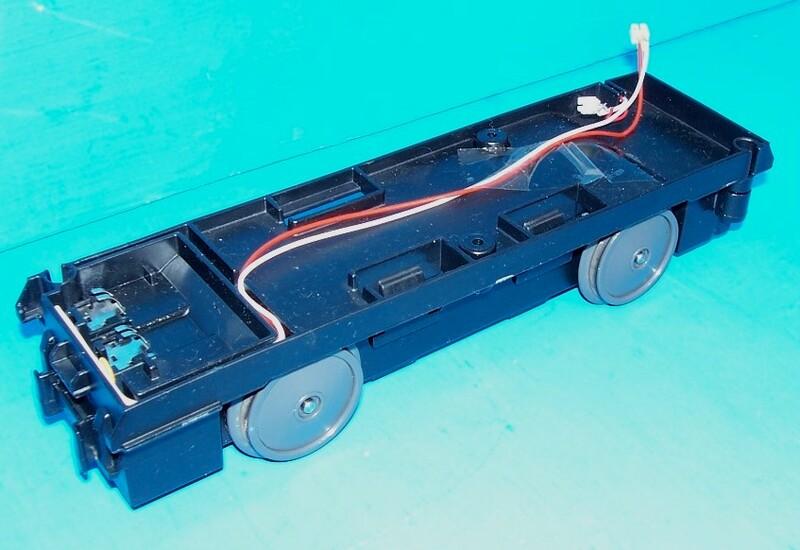 trains came out in 1998 the battery was only 950 mAh (4392) and the train would only last about 40 to 50 minutes continuous running. Later a 1200 mAh battery was introduced (4220) and the trains would run for about 70 to 80 minutes the battery would take about 14 hours to recharge when flat. for the same sets. The RCE was 4016 in Europe 4018 in the U.K. and 4020 in the USA and Canada. When a battery is put in the old blue charger the red light should come on? If not check the three contacts in the blue holder have not been pushed down as all three of these have to make contact with the battery to get to charge. 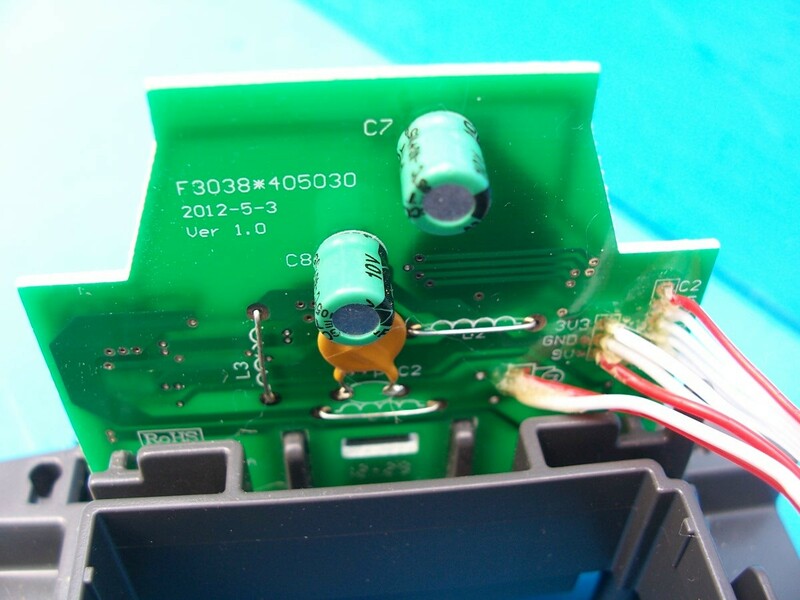 The third contact in the charger is used for the charger to detect the amount of charge in the battery. Check the contacts on the battery and in the charger are clean. The red light will come on while the battery is charging and will start to flash. When the battery is fully charged it will flash for about a second every 20 to 30 seconds. 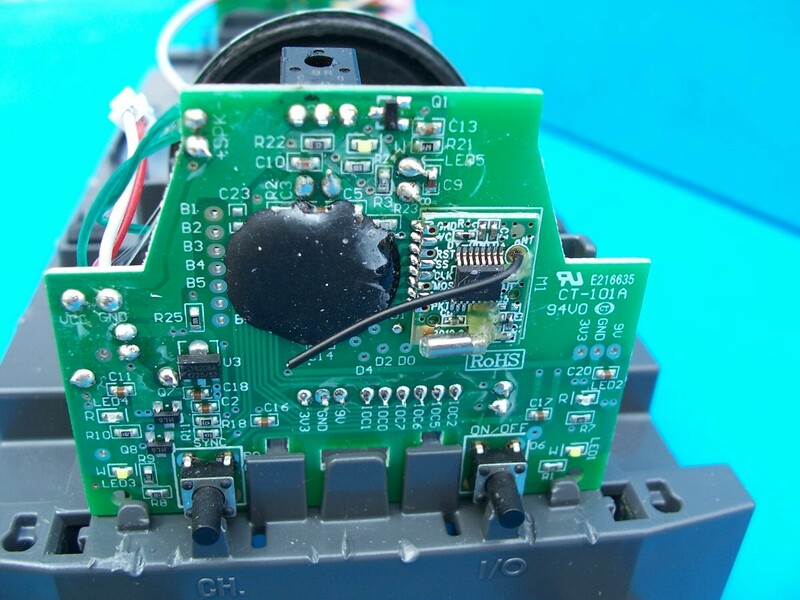 Always remove the battery from the charger when it is fully charged. When a rechargeable battery is recharged it starts too slowly discharge. Therefore if a rechargeable battery is charged after a running session and is not used for a week it will not last very long. So always recharge it just before you want to use it. There is now a type of rechargeable battery now on sale that will hold up to 98% of its charge for a year. The old blue Playmobil charger will not recharge the new battery blocks. As the new case dose not have a third contact. 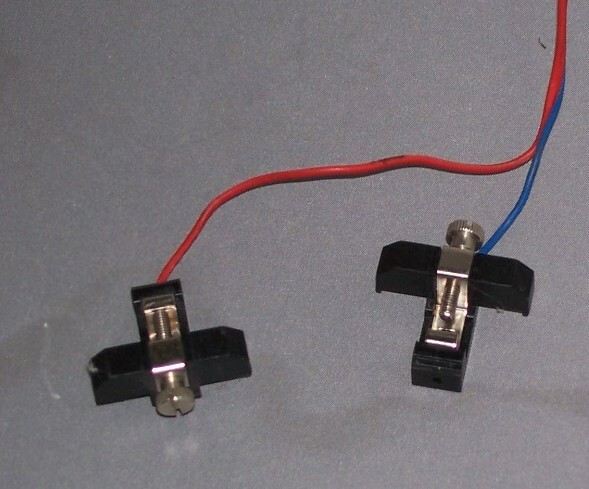 When the old black batteries are charged V1 should be about 5 volts and V2 the same or just below V1. 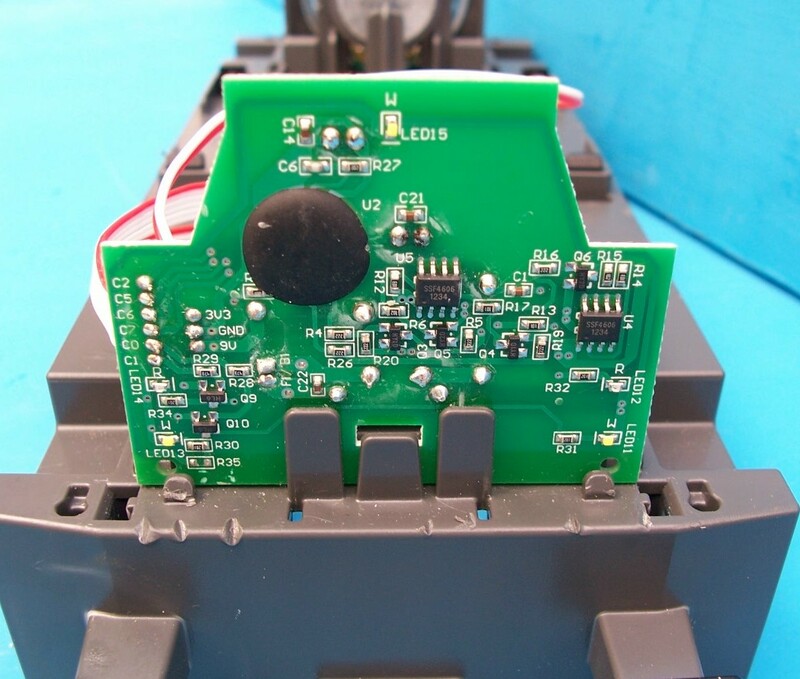 If there is no reading across the V2 contacts then the battery has broken connection inside. The maximum size of the old batteries Playmobil supplied was 1200mAh. There are now batteries available up to 4600mAh. The old chargers took up to 16 hours to recharge a battery. There are now charges that will recharge a battery in 15 minutes. 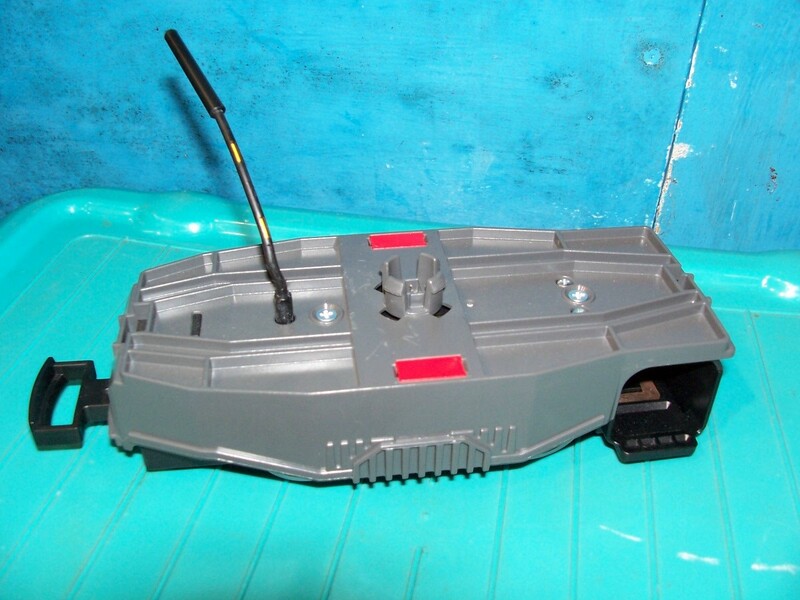 When the battery is put into the blue charger to charge the red light on the transformer should come on. Should red light go off right away it is possible that one of the contacts is not making as all three contacts are needed for the battery to charge. To hold the battery in the holder try putting an elastic band round the battery and holder. Also when buying a charger locally it will be the right voltage and have the right type of plug fitted for the country where it is to be used. With the new sets Playmobil advise you to use rechargeable batteries. 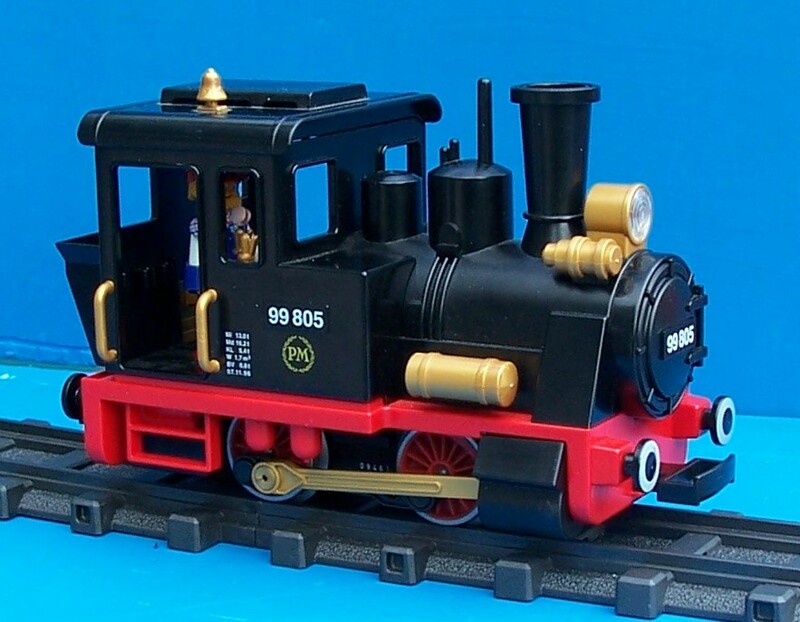 All the old Playmobil RC trains will take the new battery pack 7829. It requires four AA rechargeable batteries. Note that the bigger the battery capacity and the faster the charger the higher the cost. Get the best you can afford. Remember to charge rechargeable batteries before using them. Beware some non-rechargeable batteries are now designed for use with LED touches. These give a low current output but have a long life. These will have trouble starting a Playmobil R.C. 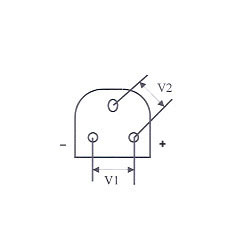 locos as the initial current required to start is about the same as to light 50 LEDs. Using 2500mAh batteries on my Playmobil layout a test with the Red locomotive on its own it ran continuously for 3 hours. It will depend on the size of the rechargeable batteries how long they last. A 750mAH will only last about 30 minutes were as a 2500mAH should last over 2 hours. If the train only goes for a few minutes or will not go then check that the battery is fully charged. If the battery is fully charged make sure that the battery contacts are clean. Also looking into the motor block battery compartment there are two contacts if these are not clean try cleaning these contacts. 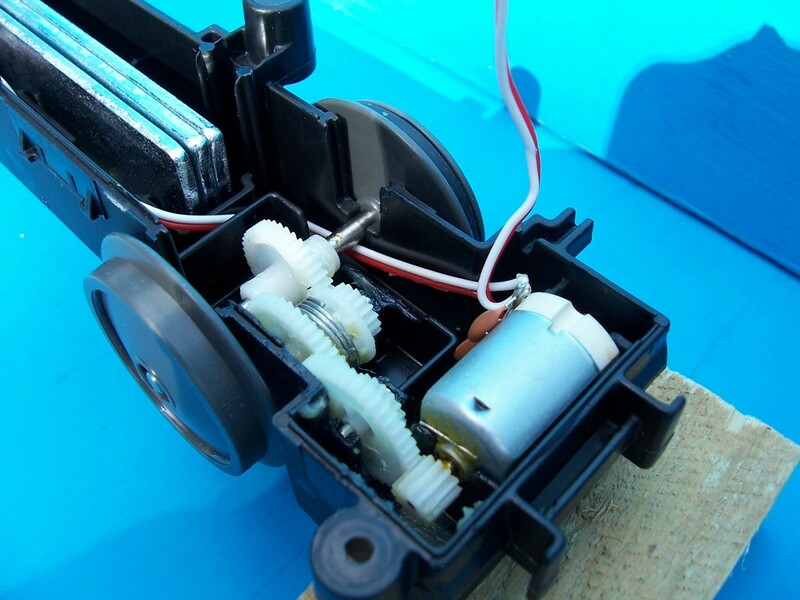 To clean the contacts try WD40 or similar give a quick spray into the battery compartment on the motor block and use a small screwdriver to scrap the contacts clean, then wipe clean with a cotton swab. The battery case may need pushing hard in so that the clip underneath it holds it in. Going round in a circle with the battery on the outside may cause it to come out and loose contact. So if the train suddenly stops for no reason, first try pushing the battery back in. Always remove the battery from the motor block when not in use. Check the battery in the transmitter is fully charged, and that the light comes on when it is switched on. Check the chip in the motor block and the transmitter are the same frequency i.e. the same colour. Another thing is to hold the motor block in your hand with the battery in and the transmitter switched on and set to full speed. 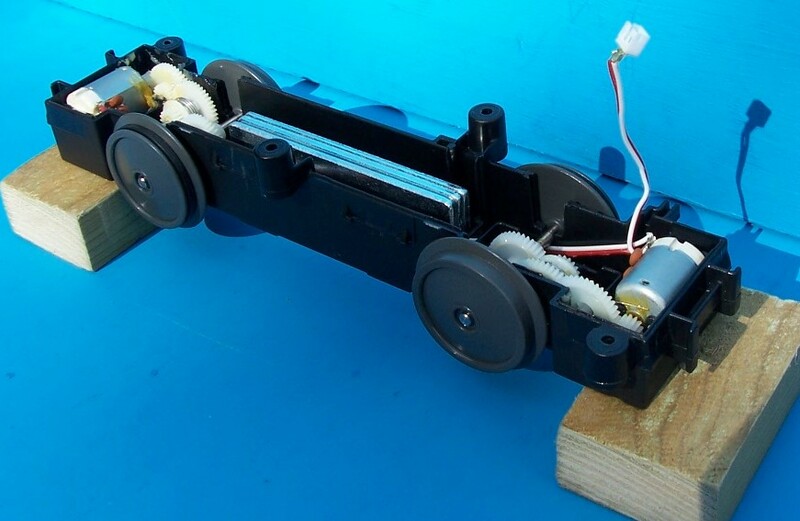 Then try pushing the chip in on the motor block keeping your fingers clear of the coupling rods. If the antennae is disconnected the motor block will still work if the transmitter is not to far away from the motor block, say within 6 feet (2m). 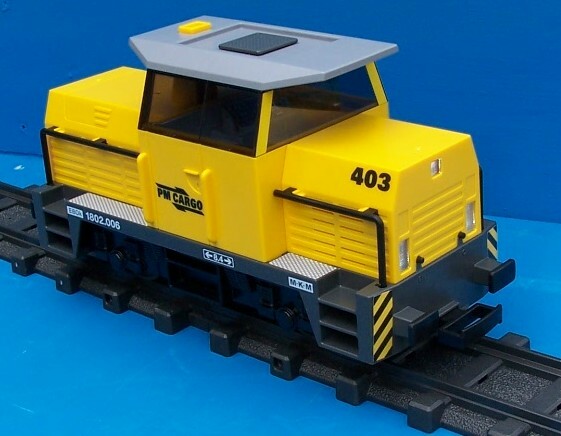 4010 and 4085 have the same single connection on the top. 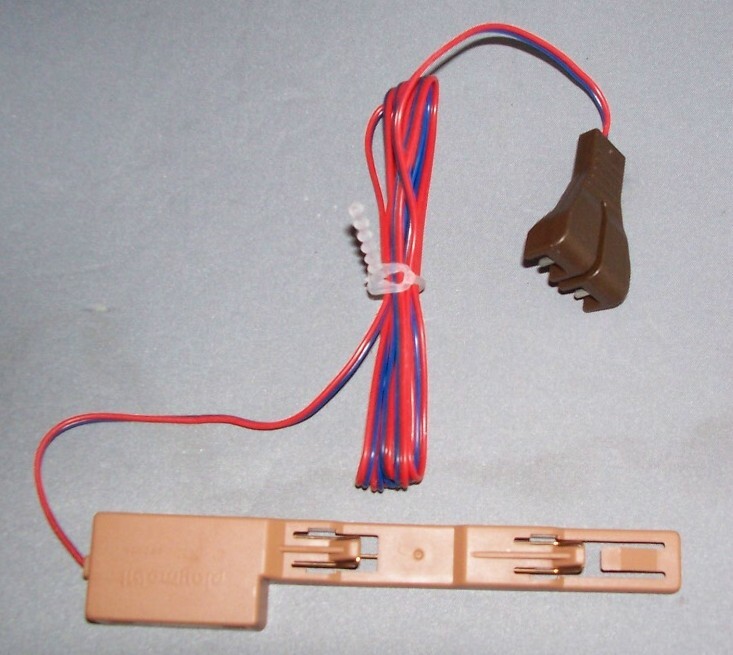 Though 4011 had the same motor block number the connection on the top has two outlets. They then had new numbers. N.B. Playmobil can no longer supply these motor blocks. Click on the photograph above to enlarge it. Should the motor block of the first R.C. sets 4016, 4018, 4019, 4020, 4021 & 4035 need to be replaced this could be done by using on of the new motor blocks form sets 4010, 4011, or 4085 as show below. THE NEW R.C. MOTOR BLOCK. 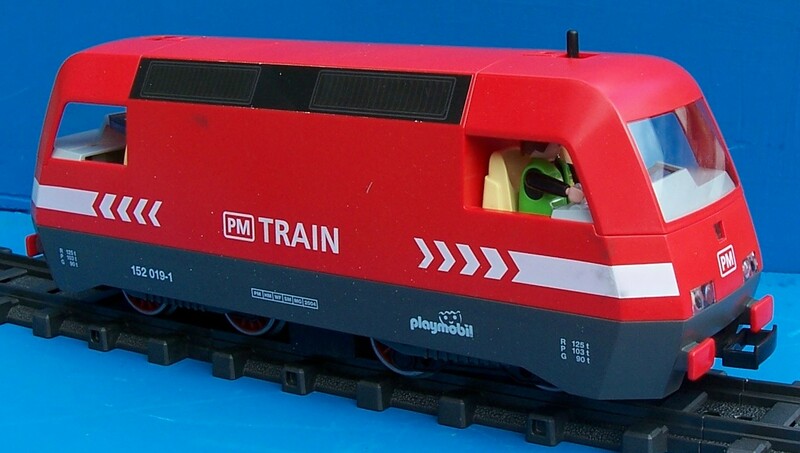 The train sets supplied by Playmobil have an AM Quartz Sets (Crystals) in the 27 MHz frequency range. Playmobil supply the Quartz sets in the following colours 7360 Red, 7569 Brown, 7570 Yellow, 7571 Orange, 7572 Green. 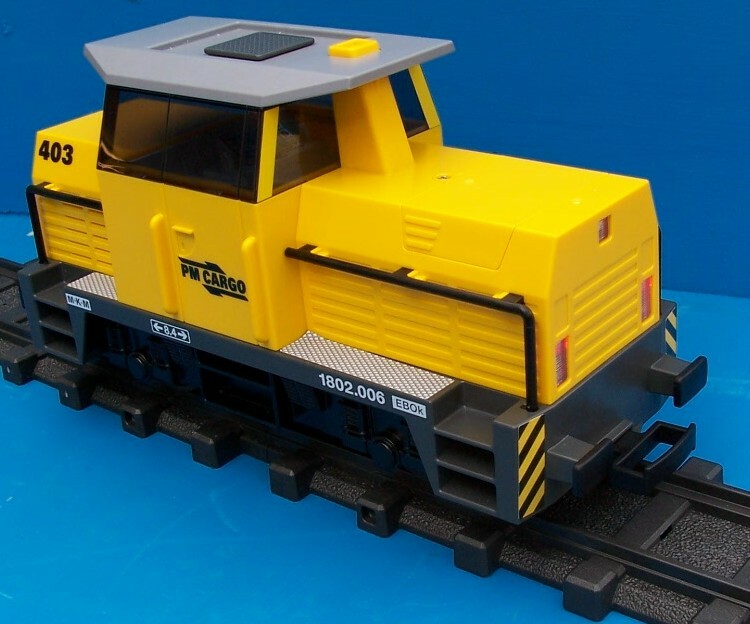 They also supplied 7568 Blue but this has been withdrawn from sale. However as there are now six trains plus the R.C. cars using the 27 MHz frequency so Playmobil do not supply enough different Quartz Sets to operate them all. There are however 12 Quartz Sets available in the U.K. for use on the AM 27 MHz range. 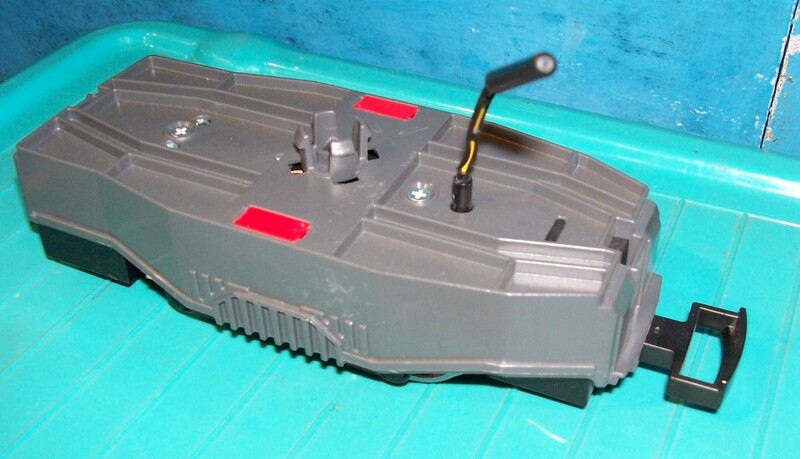 These are used for surface craft on land and water and are obtainable from good model shops that supply R.C. cars and boats. Brown 26.995 Mhz 7563. Red 27.045 Mhz 7564. Orange 27.095 Mhz 7565. Yellow 27.145 Mhz 7566. Green 27.195 Mhz 7567. Blue 27.225 Mhz 7568. Low battery volts in the train or transmitter. Metal objects, such as radiators, blinds and chairs. If you have a train engineer to control other trains this can cause problems. Check on which frequency it is operating and try to install a Quartz set in the Playmobil train that is farthest away. Other radio controlled items using the 27 MHz frequency. Paging systems in halls and outside radio operated CCTV. Other items have been found to give interference are flashing Christmas Tree lights. The loco has not been used for about twenty minutes it will turn itself off. If the controller is not used after about ten minutes it will turn off. 1 leave the controller and wait ten minutes for the controller to switch off. Then switch it on again. 2 resynchronise it with the loco. 3 you can take the battery out. 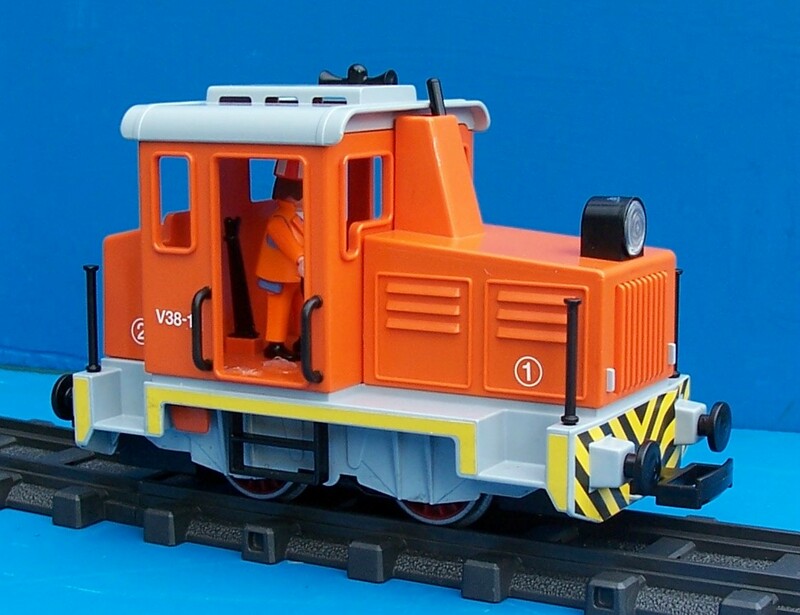 If you have two locomotives and want them to operate on different channels. First set up the first one by switching on the controller and then switch on the locomotive using the right hand button on the locomotive, the lights should come on. 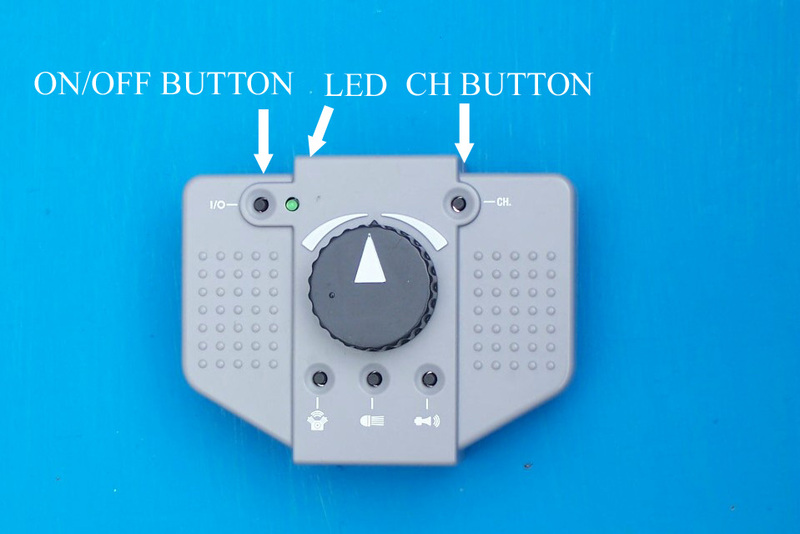 To synchronise the locomotive and controller press the (CH) button on the controller. The LED will flash, then push the left hand button on the locomotive and the LED should stop flashing when the controller and locomotive are synchronised. 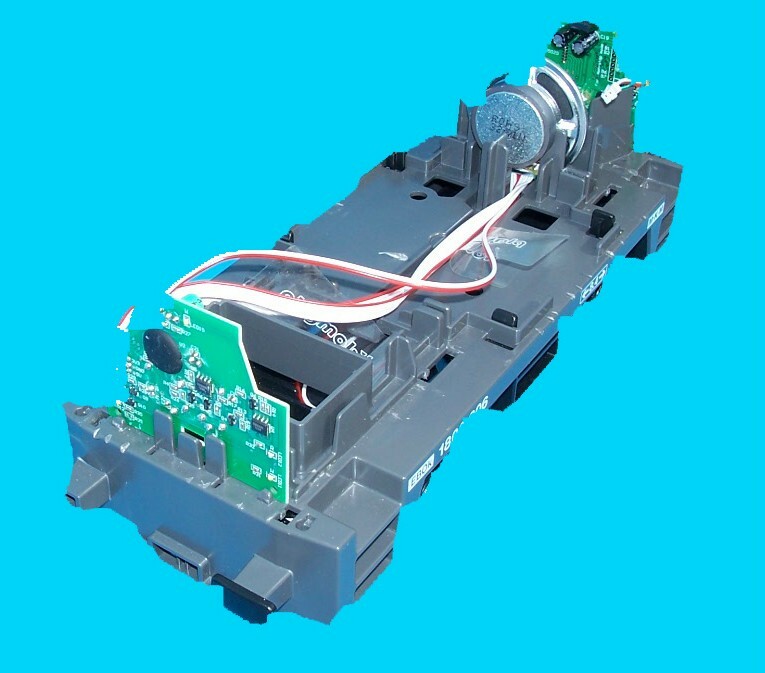 To operate a second locomotive leave the first controller switched on and repeat the process with the second controller and second locomotive. Should you have three locomotives then you leave the first two controllers switched on while you synchronise the third repeating the process for synchronising. N.B. 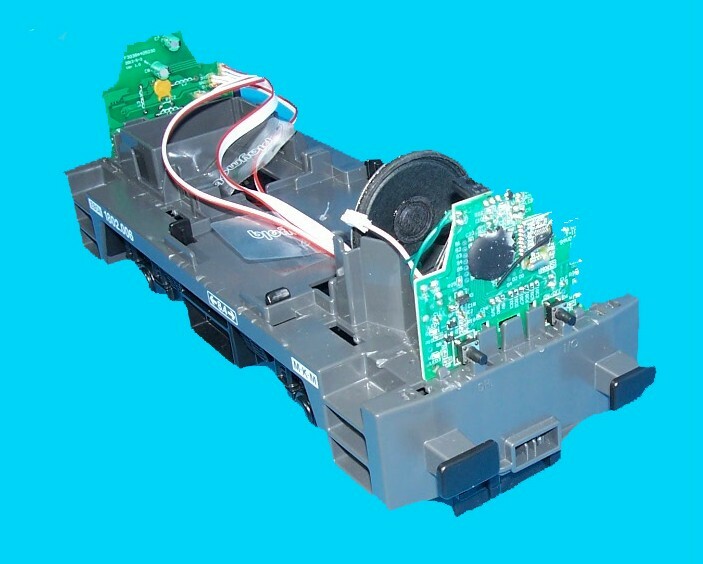 If you are using the loco and have switched off the lights on the loco with the controller then go and change the battery pack. 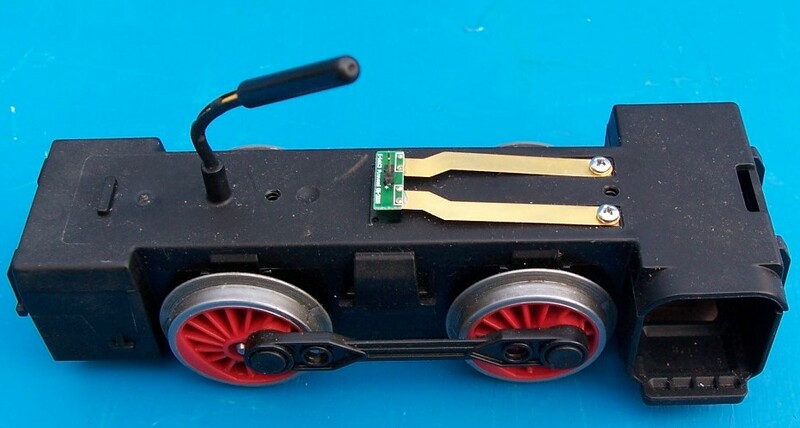 Should the controller still be switched on then when you replace the battery pack in the loco and press the I/O button on the loco to switch on the lights they will just flash. To get them to work just push the light button on the controller. To avoid this if the controller is still switched on. Check that the lights are on before changing the battery pack or switch the controller off before changing the battery pack.